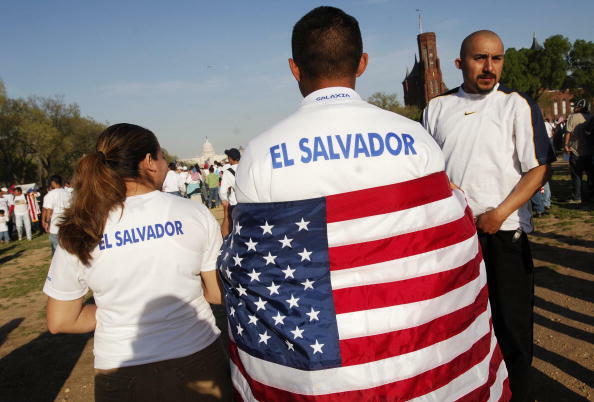 A protestor with a t-shirt bearing the name of the country "El Salvador" drapes a US flag over his shoulders during an immigration rally on the National Mall. An increase in the number of Central Americans accounts for much of the rise of Hispanics in D.C., according to newly released Census data. There were 7,557 more Central Americans in D.C. in 2010 than in 2000. Hispanics of all races constituted 9.1 percent of the District’s population in 2010, a jump from 7.9 percent in 2000. Meanwhile, the District’s non-Hispanic black population has been slowly declining over the past decade, with most estimates putting it at below 50 percent, the first time D.C. has been without a black majority in more than 51 years. Salvadorans make up the largest-single Hispanic group in the District, and the D.C. region is home to the second-largest Salvadoran population in the United States. Salvadorans are the fifth-largest immigrant group in the U.S, many of whom fled El Salvador’s civil war in the 1980s and 1990s and the country’s current economic woes. Fives Largest Hispanic Groups in D.C. The U.S. Census Bureau embarked upon a thorough outreach campaign within the Hispanic community in the lead-up to the 2010 count. They partnered with nonprofits, ran Spanish-language commercials and even got Census storylines written into Spanish telenovelas, according to Census public affairs specialist Melanie Deal. About 13 million bilingual forms were sent out in 2010; none were mailed out in 2000. But it’s too early to tell whether increased outreach accounts for the reported jump in the Hispanic population, says Deal, since information is still being analyzed and released. The official 2010 numbers, however, don’t differ much from yearly estimates put out by the Census Bureau. In 2009, the Census estimated 53,025 Hispanics lived in D.C., which is about 1,700 people shy of the official 2010 count.